Toyota Motor Corp is one of the most innovative and famous car models around the world. Though in many countries their cars sell like hot cakes where most are able to afford it, in India they have still been confined to the high end segment. With models like Fortuner, Corolla, Camry, Innova, Lexus and Cruiser, Toyota has always been regarded somewhat of an elite car in the country. At a price tag of around 10 Lakh, Innova is its cheapest offering till date. But now with Etios, Toyota is trying to gain an entry into the highly competitive low cost market. Priced at about Rs 4 lakhs and in the range of the market leader Maruti Swift, Etios expects to make Toyota very competitive in this segment. So how has Toyota managed to do this? But then it’s not all hunky dory for Toyota. This shows Toyota’s inability to balance its sales with low cost cars without affecting and damaging its reputation for quality. The Etios is priced at a premium compared to competitors like Nissan’s upcoming US $3000 car in partnership with Bajaj Auto, Nano at 1.3 lakhs and Hyundai Compact i10 at Rs 3.6 lakhs. Toyota’s poor dealer network may also hamper their chances of success with the Etios. 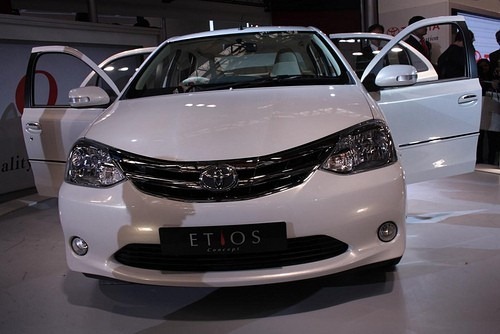 Etios will be offered in sedan and hatchback versions. As stated by law only seat belts will be the mandatory safety feature in their models. Airbags and anti–lock brakes will come for a premium. Toyota expects to sell 70,000 units this year and in 5 – 7 years it aims of reaching a market share of at least 10%. Innova and Qualis have been big success stories for Toyota and they expect to do the same with Etios. Only time will tell whether Etios can really penetrate the low cost segment and act as a game changer. What do you think? Is it a sign of desperation from Toyota?